The original Bad Boys introduced the world to the directing of Michael Bay. Paired with producer Jerry Bruckheimer (and the late Don Simpson), Bay went on to reinvent action movies, using a kinetic (and hyperactive) sense of style. Bay's camera tends to worship his subject, and this is great for people who want lots of action (and who also have trouble concentrating). Bay (Pearl Harbor, Armageddon) is again going full speed here in one of those many unnecessary sequels. While Bad Boys II has many of the hallmarks that makes Bays films fun to watch, it also lacks the sense of story that makes films compelling. So, in typical Bay fashion, he piles on the stunts; extended car chases and shoot-outs abound, as does the faux male bonding, courtesy of Ron Shelton (Hollywood Homicide, Play It to the Bone). Shelton is beginning to make a career out of law enforcement type movies, although it remains to be seen if this goes anywhere. Shelton and Marianne and Cormac Wibberly (I-Spy, Charlie's Angels: Full Throttle) have story credit, while Shelton and Jerry Stahl (Dr. Caligari) have screenplay credit, and most likely there are tons of other shadow writers. That being said, for all of his deficiencies, Bay is very good at doing what he does. He makes Will Smith (Ali, Men in Black II) look like the epitome of cool, and even makes Martin Lawrence (National Security, Runteldat) bearable. 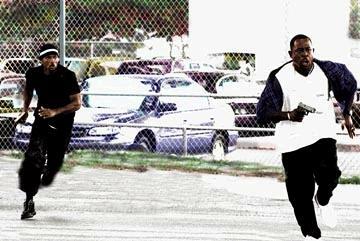 The two return as Mike Lowrey and Marcus Burnett, two flashy overactive members of a special Miami PD task force. This time they are investigating an illegal ecstasy smuggling ring. Everything is leading to Johnny Tapia (Jordi Molla, Blow, Second Skin), an insane dealer trying to enlarge his territory. Also caught up in events is Marcus' sister Sydney (Gabrielle Union, Cradle 2 the Grave, Deliver Us from Eva), who also happens to be seeing Mike behind Marcus' back. The basic shell of the story is discovering who is smuggling the ecstasy. Of course, this is standard, and would take about ninety minutes, but what fun is that? Instead, Bay prolongs the story a nearly unbearable hour later, with long action sequences that are all basically the same, which is a long car chase with lots of destruction. Bay throws in boats, corpses, and even other cars into the mix. Unlike many other movies these days, most of the cars and stunts are real instead of computer generated. Although it is getting harder to tell the difference, the crunching metal and twisted remainders of cars still looks better real than fake. The rumor here was the filming started before an ending was written. If this were true, it really shows. 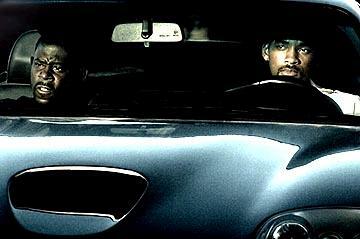 Bad Boys II has a scattershot approach to it, like it was grasping for something to hold it together. The last half hour takes place in Cuba, and is another long action sequence. This entire sequence is completely unnecessary and throws logic out the window. This is a violent movie, and wears its R rating proudly on its sleeve. Bay has no qualms about upping the level of violence to make a scene more grisly. He pans his camera around his actors, slows down bullets, and often films from the ground up to make people like Smith seem bigger. Smith two-fists guns like he came out of John Woo finishing school, and the bickering between him and Lawrence is moderately amusing. This is a huge stupid movie, excessively violent and utterly forgettable. This is what people want to watch in the summer, and it may not be very good, but there are worse things out there. 2 hours, 24 minutes, Rated R for strong violence and action, pervasive language, sexuality, and drug content.